Seyfettin Gürsel'in Notları: How bad is it going in Europe? The European Union entered 2013 full of uncertainty despite some achievements realized in 2012. In a recent interview with German daily Handelsblatt (Jan. 2), Joseph Stiglitz, Nobel Prize economist, stated that “the real risk for the World economy is in Europe." The American economist points to the ongoing economic difficulties for Spain and Greece, which are still in recession, and the absence of signs that would allow them to exit from it. Stiglitz believes that the purchase program of Treasury bonds implemented by the European Central Bank can only be a temporary solution since the ECB requires austerity conditions for its financing. According to Stiglitz this conditionality will only have the effect of aggravating the state of the sick. I agree with Stiglitz's diagnosis. 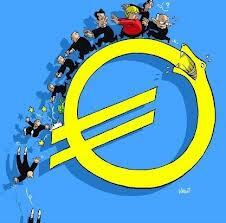 The eurozone could not solve its structural problems. Even I can assert that European managers don't have an agreed-upon strategy. The basic problem is the absence of a growth perspective. The divergence between North and South regarding economic fundamentals persist and the only cure proposed for the moment is the pursuit of austerity and painful reforms. Let's first look at the table below summarizing the state of the divergence in the eurozone. Since ECB President Mario Draghi declared that “the euro is irreversible” and since he started the purchase of sovereign bonds without limit, a certain calm occurred in financial markets. Italy and Spain can continue to borrow at the lowest rates, but their current rates (4.5 and 5.3 percent) are still quite high, putting strong pressure on their budgets. The public debts of these two big countries, “too big to fail,” will be continuing to increase in 2013 (see table) because they will still be in recession and because they will be still unable to bring out sufficient primary surplus in their budgets. The least adverse event could provoke speculative panic on their sovereign debt, squeezing the ECB into the corner. Unfortunately, these kinds of events are quite likely. General elections will be held in Italy on Feb. 24. “Cavaliere” has come back. In case of Mr. Silvio Berlusconi's victory -- this cannot be disregarded -- it will be very bad news for Europe given his anti-euro and anti-Germany discourse. The risk of a reversal in the reforms implemented by Mario Monti is serious. In Spain there are no elections, but Prime Minister Mariano Rajoy is having great difficulty in meeting the budget deficit targets. Spain must roll on 21 billion euros of public debt in the coming weeks, and this can get investors nervous if they doubt the solidity of Spanish public finances. Admittedly, Spain cannot afford an increase in its interest rates, and in such a case the recourse to the European Stability Mechanism (ESM) will be unavoidable. Greece continues to be the moribund member of the eurozone. It was rescued in extremis but it now faces very hard homework, containing tax increases, wage decreases, public employee firings and huge privatizations. The Greek economy will find it hard to reach sustainable growth for a long time even after the country repays its sovereign debt -- which will reach three times its national income. A very large write-off is unavoidable and everybody, particularly Chancellor Angela Merkel, is aware of this necessity. But since such a “haircut” will concern mainly the pocket of the Northern Europe taxpayers, Mrs. Merkel will wait until the German general elections scheduled for September before accepting the write-off. In the meantime she will be hoping that the Greeks will be able to cope with the deepening austerity and still increasing unemployment (see table). As it was the case last year, this year we will also be obliged to follow the European saga, holding our breath.